2015 was a big year for creativity on Twitter. We saw a massive increase in brands using video and short-form content, the continued rise of personalisation at scale, and the explosion of emojis in both campaigns and everyday brand communication. These shifts reflect the wider trends we’re seeing on Twitter. Toothcare brand Colgate will mark its first ever Super Bowl slot by recycling a South American ad it ran in 2014 for World Water day. Channelling social good in the pricey segment, Colgate will look to inform viewers to conserve water as part of the international initiative during Super Bowl 50. Video ad tech company Teads released a study Tuesday that aims to provide insight as to what motivates people to use ad blockers. Research Now conducted the study and surveyed 9,000 people. Active users of ad blockers, including mobile, and those who are aware of ad blockers but have not yet installed them, were surveyed for the study. The broadcast and cable networks, along with streaming services like Netflix, Hulu and Amazon, have spent the past two weeks at the Television Critics Association's winter press tour, sharing their plans for midseason and beyond. (You can find all of Adweek's TCA coverage here.) In addition to trotting out the new shows they hope will connect with audiences, the networks also addressed the industry's larger issues—chiefly, how to stay relevant in a dramatically shifting landscape—and how to solve them. 1. Reducing ad loads to entice and keep viewers. "TV is the best advertising delivery mechanism ever invented. It's unparalleled for building brands and moving consumers, but we have overstuffed the bird" and diluted the effectiveness of ads, said Kevin Reilly, president of TNT and TBS, and chief creative officer of Turner Entertainment. That's why as part of his dramatic overhaul of TNT and TBS, Reilly is going to reduce the ad load on TNT's three new dramas this year by more than half, which will add eight to 10 minutes of program time per hour. Fewer, more effective ads are essential to "create a better viewing experience," Reilly said. And if networks want to keep audiences from flocking to Netflix, reducing their "overstuffed" ad load is a solid first step. 2. The best way to make a series premiere stand out: Drop the ads. Sensing a trend here? Sometimes reducing ads isn't enough. Some networks are eliminating them altogether in order to make a splash of their series premieres. Syfy led the charge with the Magicians debut last month, and at least one other network is following suit. WGN America will premiere its next two series—Outsiders on Jan. 26 and Underground on March 9—without ads. "In today's competitive landscape, we felt it was important for viewers to get as pure and as uninterrupted an introduction to these worlds as possible," said Matt Cherniss, president and GM for WGN America and Tribune Studios. 3. Even more TV is on the way—for at least one more year. A record 412 screptedd series aired last year, along with an additional 750 unscripted series. But the 2016 tally will climb even higher before "peak TV" is reached, said FX Networks CEO John Landgraf. "I think there's a reasonable prospect there will be fewer in '17 than there are in '16. We'll get to 450 shows, and then there will be a contraction down to 350 or something like that," he said. "There's still going to be a lot of TV for the foreseeable future." For now, it's a game of content chicken, as networks pile on the new series to see which network will blink first. Apparently it won't benetflix it wont be Netflix. "We don't think there's too much TV. And if there is too much TV, someone else is going to have to slow down because we have big plans for 2016 and beyond," said Sarandos of Netflix, which will spend $6 billion on content in 2016. 4. It's open season on Netflix. As Netflix has almost single-handedly changed the way consumers watch TV, ushering in the binge-viewing and cord-cutting era, its competitors are no longer content to sit back as Netflix takes over the industry. Then, FX continued the Netflix assault later in the press tour. Landgraf blasted Netflix's 'wonky' economics, claiming the company "doesn't make any significant profit" despite its hefty original content slate. "Something has got to give eventually in that regard." Netflix, predictably, was unfazed by the criticism, but the company clearly has a target on its back this season, as its competitors look to prevent it from grabbing even more subscribers and buzz. 5. Making a Murderer could be the season's most influential new show. Hollywood always wants to clone the hot TV series of the moment (think Friends, Lost, Desperate Housewives, Modern Family and Empire), and the next show that the industry wants a piece of is Netflix's red-hot documentary series Making a Murderer. It came up multiple times throughout the press tour (everyone from Secrets and Lies star Juliette Lewis to Love executive producer Judd Apatow raved about it). Especially after the Serial podcast's first season caused a similar fervor, networks are eager to jump on the true-crime bandwagon. Investigation discovery is first in line. The network is fast-tracking a Steven Avery special, which will air later this month. And Netflix might also release a follow up: Making a Murderer's co-directors Laura Ricciardi and Moira Demhave said they have spoken to Steven Avery "several" times in the past month. "We did record those calls, with an eye toward including them in any episodes, should there be any future episodes," said Ricciardi. Plus, given Netflix's success in picking a strateic holiday release date for the show—which allowed audiences to binge-watch and obsess over it during the Christmas and New Year break when there was no other new TV content competing for attention—look for more companies to try their luck with that slot this December. London Virtual Reality may be grabbing all the publicity but augmented reality (AR) is where marketers can make the most gains, an industry figure has said. Writing in the current issue of Admap, Liz Faber, a digital strategist at SapientNitro, argued that VR was a total immersion technology that lends itself to deeper gaming and entertainment experiences. Changes to Facebook’s CPC strategy and improvements to its ad products coupled with the wider availability of Instagram ads mean social ad spend growth is overtaking search at a significant rate. LAS VEGAS — YouTube sees a future where more folks will be watching video than television. In fact, it will be here in just a few years. In a speech at the Consumer Electronics Show, YouTube chief business officer Robert Kyncl predicted that viewing patterns will shift dramatically. “Digital video will overtake television to become the single largest way people spend their free time before the end of this decade,” he said, citing mobile viewing, virtual reality and music programming as the drivers of the shift. More than just making electric vehicles, luxury automaker wants drivers to stay safe and healthy too. With the "Audi Fit Driver" system, the idea is to monitor your vitals via a fitness tracker or smartwatch, comparing aspects like current heart rate and skin temperature against previously gathered data to get a picture of your state while behind the wheel. From there, the system will analyze data gleaned from various vehicle sensors to determine your driving style, weather-and-traffic conditions and breathing rate, according to a statement from the company. Sony's chief executive has told the BBC that developers are working on 100 or more titles for its forthcoming virtual reality headset. HTC and Oculus have made more noise about their rival gear at the CES tech show over recent days. A Chinese company has unveiled the world's first commercially available passenger drone at the Consumer Electronics Show (CES) in Las Vegas. The Ehang 184, created by Guangzhou-based company Ehang, essentially looks like a larger version of a quadcopter drone - except with a small cockpit in the middle capable of carrying a single passenger. Pilotless planes have been developed and tested before, but Ehang says their vehicle is the world's first commercially available self-flying aircraft. Ehang has only revealed short videos of the drone flying in tests, but they claim it's capable of flying for 23 minutes after only two hours charging time, when carrying a maximum weight of 100kg - around the weight of a single passenger and a small backpack or piece of luggage. Ehang said the 184 had undergone more than 100 test flights at low altitudes near Guangzhou, even carrying a passenger a number of times. It's designed to fly fairly low, at altitudes of between 300 to 500 metres, but its creators claim it can reach 3,500 metres at the most. It's also got a fairly nippy top speed of 63mph. Reassuringly, they promised that their device is fairly safe - even if one of the 184's four rotors fail, the other three will be able to take the aircraft down into a rough emergency landing. 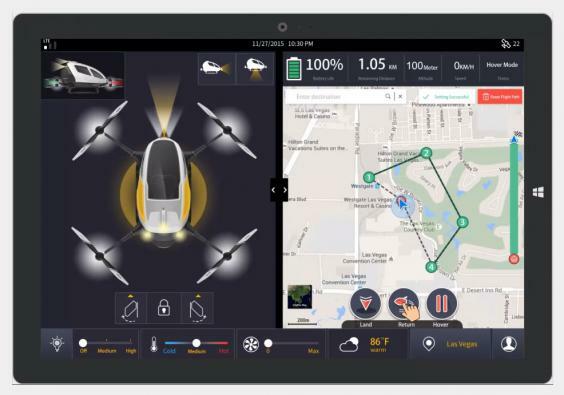 The most interesting (and scary) part about the drone is that it's autonomous - passengers choose their destination and route on a tablet, and can only choose to either 'take off' or land'. They can't issue any other directions to actually pilot the drone themselves, which means, according to the creators, passengers won't need a license to fly one. But considering that the humble hover board if illegal to use on the UK's streets, it's unlikely that prospective Ehang 184 owners would ever be able to fly in their drones without some kind of permit. Although drone pilots in the UK are currently fairly free to fly their devices as long as they stay away from built-up areas or restricted airspace, there's plans to introduce further regulation and controls like a US-style registration system in the works - so devices like the Ehang 184 would certainly face tight restrictions if they ever came to market. Ehang co-founder Shang Hsaio says the 184 is likely to cost between £140,000 to £200,000 after its proposed launch later this year, but having raised tens of millions of pounds in investment, Ehang could yet bring out a more affordable version. The 2016 Consumer Electronics Show has a definite theme, and it hasn’t been terribly difficult to uncover. The automotive industry is dominating the show’s news cycle, with a host of manufacturers debuting advances in connectivity, autonomous-driving features, and increased links to “The Internet of Things.” Bosch, a foremost supplier to the automotive world, is no different and is showing off a neat haptic-feedback touchscreen, autonomous-driving tech, and enhanced cloud-to-car-to-everything protocols.